Background: The TMS992ANL chip used in the Sega and many other home computers, has native component video output. This should give a much cleaner picture than the cruddy composite video signal that the Sega outputs via its 5-pin DIN video port. The good: I am the first person I know of to get a Sega SC-3000 (briefly) displaying on a modern LCD TV, via component video inputs, with no external circuitry. In fact, I have completely bypassed the video daughterboard to do this. The bad: I just blew up my TMS9929 chip's luminance output. I completely disconnected the Sega's video daughterboard, and connected pin 36 of the TMS9929 to my TV's component (YPbPr / DVD) luminance (green) input. In theory, this would give me a monochrome picture. Tried this both using a voltage divider of a couple of twisted-together resistors, and without. Was very fiddly, too many loose connections, but at one point I had a PERFECT monochrome image. Stable, sized properly (TV was doing 4:3 stretch to 16:9, could turn that off). At some point I lost the picture, wondered if my signal was strong enough, so removed the divider. Dumb move. Chip's luminance output blown. More research needed, but I am pretty sure can figure this out. Will build proper connection, which will include AC coupling, as well as connecting the Pb Pr connections (oddly, those voltages look correct level for TV). Sounds like good progress! What are the chances that your mods would be able to be built into a new daughterboard as to avoid hacking up the SC? I might have two of them but they are both good workers, don't want to accidentally end one of them. That connector has luminance, Pb, and Pr from the motherboard. Few things still to suss out there too. How cable would reach outside the SC-3000 is up for debate. Personally, I'd go for replacing the 5-pin video DIN with an 8-pin, a-la the Yeno model, as the motherboard already has the holes for it, but you could call that a hack too! Or, you could run cable out of a gap somewhere. That connector has luminance, Pb, and Pr from the motherboard. That was what I was thinking too. A nice, clean plug in replacement. 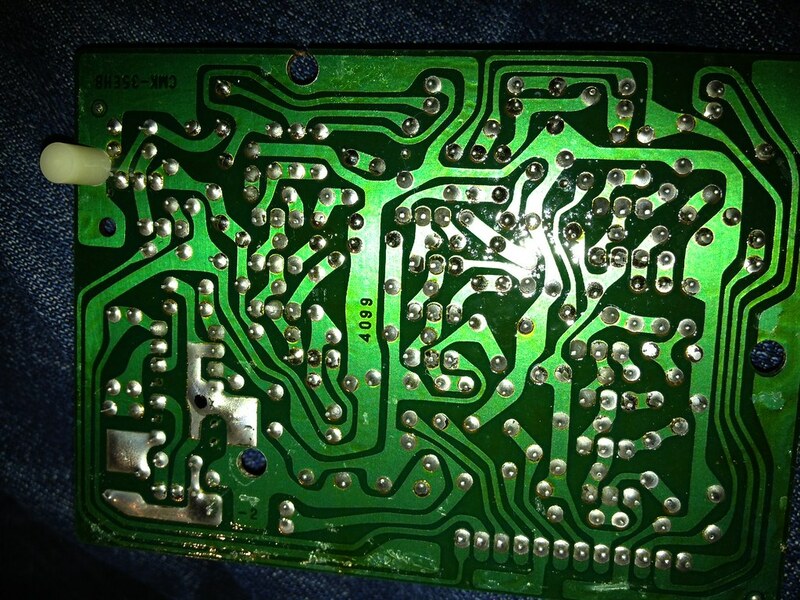 If you can get a working design, then I'll do my best to create a PCB for it and see if I can make up a few kits. natshaw wrote: How cable would reach outside the SC-3000 is up for debate. Personally, I'd go for replacing the 5-pin video DIN with an 8-pin, a-la the Yeno model, as the motherboard already has the holes for it, but you could call that a hack too! Or, you could run cable out of a gap somewhere. If I was doing it just for personal use, I would be tempted to replace the DIN connector and make up a custom cable too. 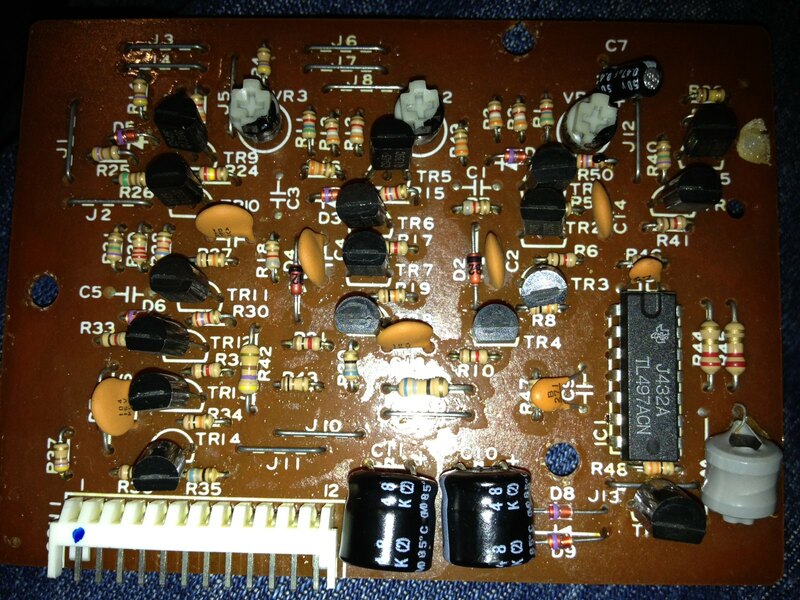 But (without having looked to confirm) I suspect that might require cuts to some of the traces or jumper wires on the SC-3000 main board and will require some soldering skill. So that makes it a little less accessible, although realistically it is probably only people who know their way around a soldering iron that would be interested, so that might not be an issue. But the ideal would be a plug in kit that anyone with a PAL SC-3000 can use with a minimum of technical know-how and soldering skills. So that sounds like several cables poking out the back of the computer and people either cutting one big hole for the cables, or several smaller holes to attach the component connector sockets to the case. I could possibly supply a mounting board for the component connectors to make it easier to glue that in place. By the way - have you figured out the trick of disconnecting that bloody connector to the graphics board? I can see it has a little locking mechanism on each side of connector, but is there an easy way to release it, or do you just have to muscle it? Agree with above. No trick, I just grab the very ends with a pincer grip and wiggle/pull. Slight step backwards tonight. I connected my working Sega Yeno's TMS9929's luminance+sync (Y) pin to my TV, using roughly correct load resistance and also with/without AC coupling capacitor...nothing. MAYBE got sync once every 10 seconds. No picture at all, black screen. Weird. Confirmed inputs working OK. I think the voltage range (i.e. the max-min voltage) output is too small. I need to dig into this, coz on my NZ PAL Sega, voltage range seemed to great (before I blew it up). 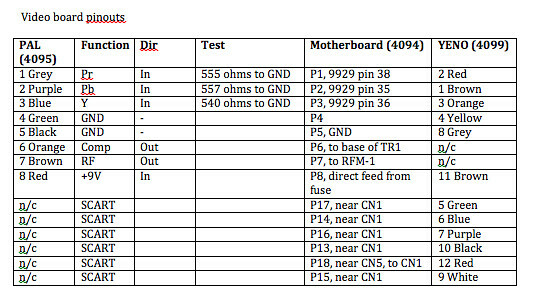 I wonder if the Yeno motherboards are doing something different, since they're driving a different circuit. Sega SC-3000 video board pinouts. Posting this as part of workings to get TMS9929 working to component video. Hmm table layout not good. Note that a Yeno motherboard already has all the connections to its 8-pin DIN video socket that would be needed, if one were to replace the 4099 video daughterboard with a component video board instead. Note: SCART indicates one of following: R, G, B, Composite Sync, +12V, +2.xV. Will post exactly which is which soon. I'm not following this too closely, but I presume you've checked the datasheet at http://emu-docs.org/VDP%20TMS9918/Datas ... MS9918.pdf, in particular the output conditions? This chip is designed to output something like 3 volts into a 470R load - another table shows 0.7-1.0V but doesn't specify an output load. Your TV will expect 1.0V p-p and probably presents an input impedence of 75R. It's not beyond the realms of possibility that the lack of buffering has also killed your chip, especially if it's not designed to drive a 75R load. I'd be really reluctant to feed the signal anywhere without some buffering - just an op-amp in non-inverting mode would be fine. I'd even give it a crack with a TL074 quad op-amp - they're cheap, but I haven't made sure they're fast enough for video. There's also a chance of some offset voltages there, especially if it's on a single rail - did you decouple it? Come to think of it, if there's only a single rail then a TL074 won't the best choice, but I'm sure you could whip up something - maybe even just have an '074 on a bench PSU until you get a better idea of what's going on. Thanks arjoll, can you offer any tips on DC-offsetting? 1. How to remove it? If I just use an inline cap, how do I determine which original voltage level will become the output's 0V? 2. How to add a - or + DC offset if I need one? natshaw wrote: 1. How to remove it? If I just use an inline cap, how do I determine which original voltage level will become the output's 0V? Exactly right, a capacitor in series. The output will be at a nominal 0V - if you think of a signal swinging between 2 to 6 volts, this will become a signal of 2VAC. When it crosses through 4V on the input it will be 0V on the output. There's no set original voltage that will become 0V on the output; 0V will be any point where the signal is at a constant DC voltage at the input. The issue will be determining the correct value C - too low and you'll attenuate low frequencies, too high and you may get some leakage issues (because that's starting to imply electrolytics!). I'm more used to dealing with audio than video, so I'd need to do some research on the calculation for the best value of C.
natshaw wrote: 2. How to add a - or + DC offset if I need one? Feed the signal through a cap (to block DC getting back to the source) then a potential divider between rails. There's no point adding DC bias unless you've got some other circuitry after things that needs it. If it's heading out of your circuit then next the next piece of equipment add bias if it needs it. You certainly need some kind of buffering - this can provide the amplification or attenuation, but also protects the TMS9929 from the outside world. Let a $2 IC become the sacrificial element if anything goes wrong, not whatever's buried in the guts or your Sega. If you haven't got a split rail (say +/- 12V) then things become more difficult, I see you're reading up on operating op-amps from a single-ended supply, the other option is to use an op-amp already designed for this - e.g. the LM324 but it may not be fast enough for video. Most gear will have coupling caps, it's just safest to assume that they don't. You don't want DC floating around where it isn't needed! Being doing lots of reading on video standards. Really interesting and clever stuff. Rather than rely on an absolute analogue level for luminance (back in the B&W days), the incoming signal's brightness amplitude is effectively worked out using IRE units - this is akin to amplitude percentage. If you think of a negative sync pulse part of the signal as always having a certain amplitude, and the black part of a line as always have a certain amplitude, then if you can those parts of the signal you can determine what attenuation or amplification the signal requires. Google for video signal and IRE units. Cool stuff. Anyway, I suspect this means than a simple bit of impedance matching might be all that's required, and ensuring signal is within cooee of what's expected. A video bandwidth transistor or op-amp and a few other bits might be all that's required. Will try and construct test circuit today. AC coupling capacitors are apparently not great for video, due to the relatively lengthy DC signals at various points. Approaches seem to be to either use a massive cap (hundreds of uF) or else 2 smaller ones and some other trickery. I only have NTSC consoles. I'm running directly off of the TMS9928A's pins 35, 36, and 38. I'm guessing this would work just as well from a TMS9929A. It is a nice little package and not dissimilar to some of the packaging ideas we discussed earlier in the thread. Interesting idea leaving the potentiometers as user adjustable. That sounds like a sure way for an end user to stuff it up But it has a good section on how to tune the board and the optional video test pattern PCB is an interesting idea too. The other lesson from this is that a plug in replacement daughter board would be way more usable for most people than having to solder multiple wires. The process in that installation guide is going to scare off a lot of people. Just throwing it out there for ideas. Yeah very interesting! Have emailed the creator to see if he can offer any advice. Looks identical to what we're discussing - component straight off the TMS992x. Yes, re end-user installation...agree, think 4095 board connector is still best idea - maybe run a short flat ribbon cable out a vent hole? Or, sneak it through the case between keyboard and front top cover?